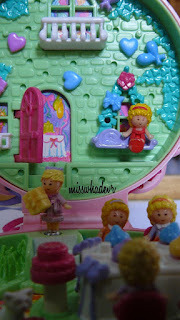 One of the Polly Pocket I own. PP was one of my childhood toys, back in 1993. I am still having 'em (now I'm 21), but feel really sad because my friend stole one of my collection (yeah, back in 1993/1994, so I couldn't call her a thief. But that one was so beautiful, with a diamond inside). I was about 5 or 6 when I got my first PP. My Mom and Dad were busy parents, traveling around the world for business causes, so they always bought me and my brothers toys to cheer us up. I loved PP tiny house and tiny pets. Polly Pocket name came in pocket-size cases, and that we could fit them in our pockets. But today, they made them bigger and bigger. I guess my daughter(s) will need gigantic pockets to put them in. Watch their growth here. I also owned Barbie! A lot of Barbies completed with their saloon, restaurant, sewing machine, washing machine, bicycle, motorcycle, dressing room, clothes, pairs of shoes, and their giant house. I think I was about 2 when I got my first Barbie. Unfortunately, when I was 9, I destroyed them. I washed their hair, CUT their hair, and blah and blah, and few years later.. where the bloody hell are they? Two months ago, I gave the Barbie sewing machine, shoes collection, and multifunction box to my beautiful nieces (cousin's daughters). I guess I still have the bicycle and motorcycle. Those were so expensive. And also Troll dolls!! I owned them. I love their brightly colored hair, creepy-but-cute faces :D Oooooh.. childhood!! Back in 1990s, I opened my PP with smiles. And today, I opened my compact powder. To pinch my pimples. Yesssss I love them too! I gave mine to Sarah and I'm gonna take them back when Kayla and Tara are 5 years old :-D Buuuut I HATE Trolls! They were soooo creepyyyyy..